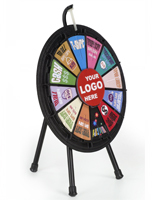 This Prize Wheel is Ideal for the Office and the Classroom! This Custom Roulette Display is used to Give Away Awards! 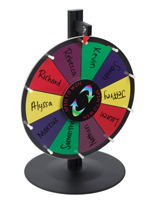 This Prize Wheel of Fortune is Ready to Ship! Black erase board boldly shows off neon dry/wet-erase or liquid chalk markers and can be updated in an instant. 6-12 Sections for writing in fortunes and prize giveaways. Black aluminum stand for a sturdy tabletop game. Plastic flapper creates a clicking noise reminiscent of any casino in order to create fun and excitement. 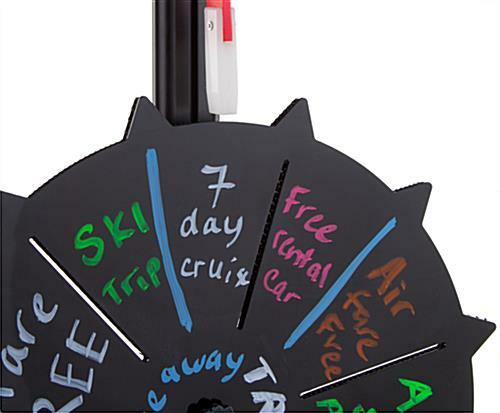 This prize wheel that has a black wet-erase surface is an easy to change award giveaway. This custom display is ideal for office events to boost employee morale and increase involvement. 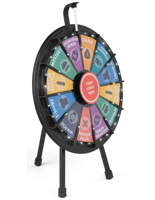 This fortune awarding device, prize wheel that is 19" in diameter fits nicely on nearly any tabletop. 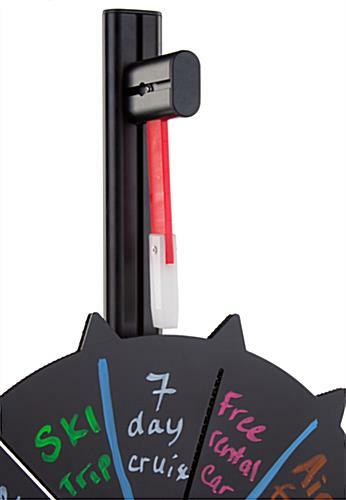 This custom promotional display includes a black aluminum base and stand that is 35-3/4" tall. 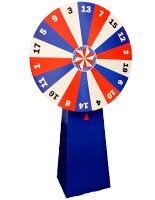 This prize wheel that includes a plastic flapper generates a clicking noise much like that of casino roulette! 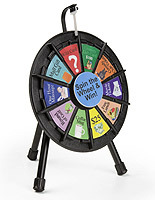 This fortune display game has 6-12 sections so purchasers can decide how many prizes to offer depending on the crown and availability of giveaways. 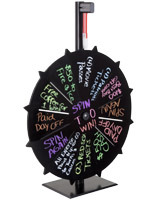 This prize wheel is perfect for any fun occasion. This display is offered at a great price. 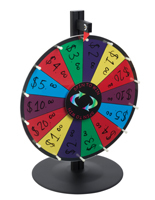 This tabletop prize wheel, also known as a roulette spinner, is set up on an aluminum base and stand that sits sturdily on a table. 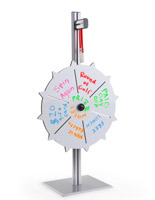 This promotional spin game stand is similar to casino roulette and creates a buzz of excitement! 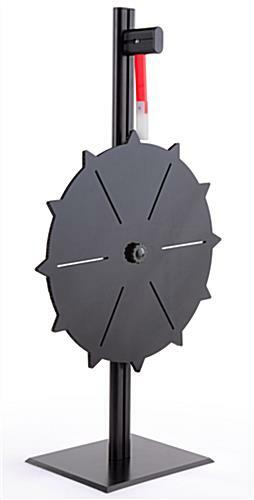 This black prize wheel is sleek and stylish to fit into any environments décor. This custom display is ideal for offices, retail stores, trade shows, and any environment where there is a crowd to excite. This prize wheel is interactive and can be updated instantly with new awards. This game is for use with wet erase or liquid chalk markers only. This prize wheel is ready to ship! Customer Please Note: This prize game is designed for use with the wet-erase markers or liquid chalk markers. We do not recommend the use of dry erase markers, as these may leave "ghosting" on your game wheel.